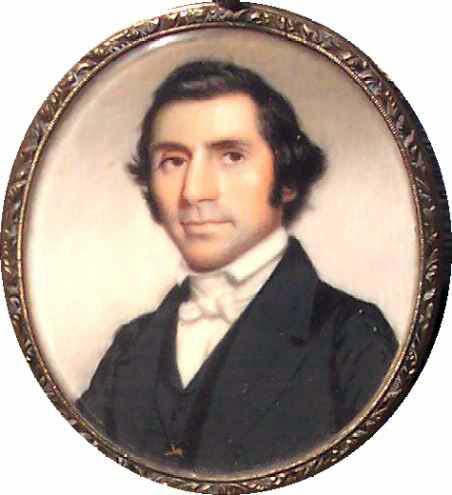 Presented here, an American portrait miniature, watercolor on ivory, circa 1830. It is set in the original gilded locket case, the reverse with an aperture containing plaited hair. The sitter as well as the artist is unknown, but it is obvious it was a person of considerable talent who painted this portrait. The gentleman is realistically portrayed with a somewhat angular face, a faint smile on his face lends a pleasing demeanor and the shading on his face would indicate that he has an obvious "five-o'clock shadow". How realistic is that? Size is 2-1/2" x 2-1/8" (sight).